It’s been a busy summer and I haven’t been able to post here. But with the summer came a great read. Especially if you’re a runner. 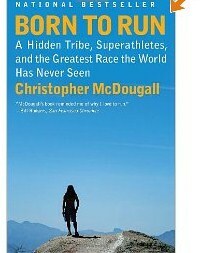 If you haven’t already, and you are a runner read Born to Run. Not since George Sheehan’s Running and Being has a book motivated me so much to run. Born to Run is being credited for starting the “barefoot running” movement. But Born to Run is more than a story of foot anatomy and why we have more injuries the more we cushion our feet. Author Christopher McDougall takes us on a journey into the Copper Canyons of Mexico and a search for the elusive Caballo Blanco and the Tarahumara Indians. This where he finds extraordinary runners. Not only do these natives of Mexico run distances of 100 miles or more but they do this barefoot or with barely anything on their feet. McDougall takes the reader through the compelling research that discusses how the more cushioned a running shoe is the more we can be susceptible to injury. Listen to the evidence and decide for yourself. The story continues and culminates as the author joins with Caballo and other world class ultra-trail runners as they race against the Tarahumara in their Copper Canyon (the greatest race the world has never seen). If you love running order your copy today! With alcohol being the most common drug of choice one has to wonder what effects it has on your athletic performance. Sorry folks but this blog has to be written. For the most part the people that I run into in the gym seem to have their acts together as far as their alcohol consumption is involved. But every once in a while during an early morning workout I’ll catch a whiff of someone’s partying the night before. Now far be it for me to judge anyone on how they use their down time to kick back and relax. But if your goals include chasing your PR’s and pushing your body as far as it can go then realize that your nutritional intake includes EVERYTHING you digest including what you drink. So, ok I hear it now. “Hey I drink and I’m doing just great”. Well think about how much better you would be doing if you didn’t.